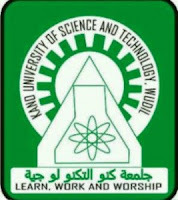 The management of the Kano University Of Science And Technology (KUST), Wudil,has released the acceptance fee and admission letter printing procedures for the 2017/2018 academic session newly admitted candidates. Read Also: KUST Admission List. KUST Acceptance Fee Payment, Admission Letter Printing & Clearance Procedure. Candidate shall make a payment of Two Thousand Naira Only (N2,000.00) as acceptance fee and One Hundred and fifty Naira Only (N150.00) as bank charges to any branch of Zenith Bank nationwide from Monday, 19th February, 2018 to 26th February, 2018. Candidate shall collect a pin after payment. Use your pin and JAMB no. where appropriate and click on SUBMIT. Candidate shall present himself/herself on Monday, 26th February, 2018 at the University premises for screening at the designated area of his/her programme. Candidate shall come along with Originals and photocopy of their credentials and his/her SSCE/NECO result checking card.